32 | TH E M R EP O RT FEATURE associated with remote notariza- tions is being able to execute the notarial act from any location at any time of day, making the notarization process much more convenient for the consumer. Addressing Security Concerns S ince these transactions take place electronically, there are certain authentication measures that must be met to verify the signer's identity. This is typi - cally done through knowledge- based authentication, a process that presents questions to the signer about personal informa- tion found in up to 30 years of public records, such as credit re- ports, loans, and more. In order to prove his or her identity and gain access to the document, the signer must correctly answer a certain number of questions within a designated time frame. Once the signer's identity is verified, he or she then enters a video call with a certified e-notary public. And because the notarization is performed remotely, participants of the video call may be located in different cities or even different states. To execute the remote notariza - tion, both the notary public and the signer use digital signatures to sign necessary documents. Digital signatures, also known as Independent E-Signatures, are more secure than simple e-signatures because they permanently embed the legal evidence of each signature into the signed document. Tamper-evident technology found in digital signatures detects any unauthorized changes to a document. The document is also accompanied by a comprehensive audit trail that records each step of the signing process to defend against a legal contest. Each of these features provides immutable legal evidence to prove the valid - ity of both the document and its signatures. The Leading Legislation B ecause individual states de- termine their notarization re- quirements, state legislatures play a key role in facilitating the technol- ogy's widespread adoption. Many of them have already enacted or are currently considering bills that would allow the practice. It all started in 2011 when the state of Virginia introduced the Electronic Notaries Act. This law made e-notarizations and remote notarizations possible by enabling signers from anywhere in the world to appear live before a commissioned notary public on a screen—via Skype, Facetime, or another audio-video teleconfer - ence option—and get a document notarized. Virginia's standards for the elec- tronic notarization process include three specific things: • There must be detailed identity authentication measures that confirm a signer is who he or she claims to be. This typi - cally includes knowledge-based authentication, which gives per- sonal and historical questions that the user must correctly answer and which may be one of two or more steps in a mul - tifactor authentication process. • The metadata and legal evidence of the signing process must be embedded within the signed document. That stipula- tion automatically rules out most e-signature vendors, since metadata is typically stored on the vendor's server. • The document must include tamper-evident technology to ensure that any compromise of integrity in the document would be made known to the parties involved. 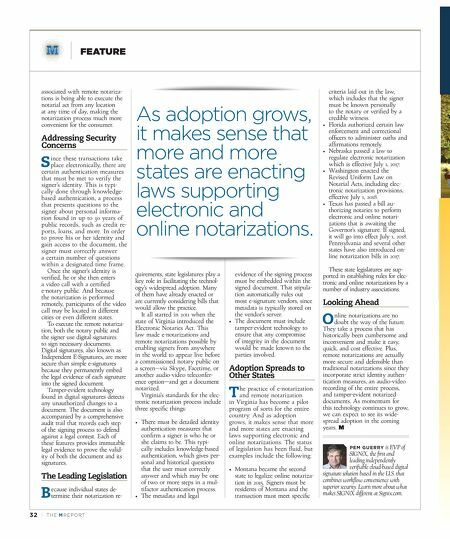 Adoption Spreads to Other States T he practice of e-notarization and remote notarization in Virginia has become a pilot program of sorts for the entire country. And as adoption grows, it makes sense that more and more states are enacting laws supporting electronic and online notarizations. The status of legislation has been fluid, but examples include the following: • Montana became the second state to legalize online notariza - tion in 2015. Signers must be residents of Montana and the transaction must meet specific criteria laid out in the law, which includes that the signer must be known personally to the notary or verified by a credible witness. • Florida authorized certain law enforcement and correctional officers to administer oaths and affirmations remotely. • Nebraska passed a law to regulate electronic notarization which is effective July 1, 2017. • Washington enacted the Revised Uniform Law on Notarial Acts, including elec - tronic notarization provisions, effective July 1, 2018. • Texas has passed a bill au- thorizing notaries to perform electronic and online notari- zations that is awaiting the Governor's signature. If signed, it will go into effect July 1, 2018. Pennsylvania and several other states have also introduced on - line notarization bills in 2017. These state legislatures are sup- ported in establishing rules for elec- tronic and online notarizations by a number of industry associations. Looking Ahead O nline notarizations are no doubt the way of the future. 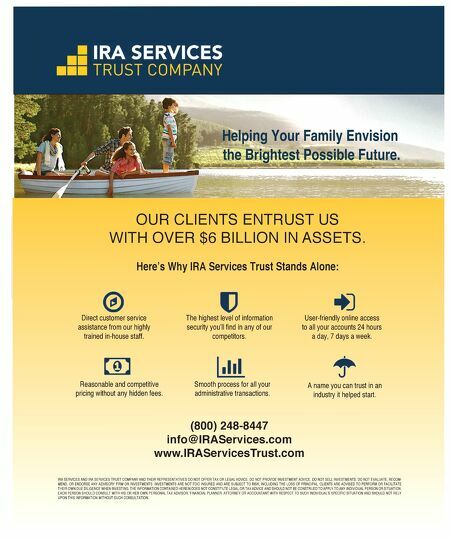 They take a process that has historically been cumbersome and inconvenient and make it easy, quick, and cost effective. Plus, remote notarizations are actually more secure and defensible than traditional notarizations since they incorporate strict identity authen - tication measures, an audio-video recording of the entire process, and tamper-evident notarized documents. As momentum for this technology continues to grow, we can expect to see its wide - spread adoption in the coming years. PEM GUERRY is EVP of SIGNiX, the first and leading independently verifiable cloud-based digital signature solution based in the U.S. that combines workflow convenience with superior security. Learn more about what makes SIGNiX different at Signix.com. As adoption grows, it makes sense that more and more states are enacting laws supporting electronic and online notarizations.